Happy weekend all!! I have some fun, quick cards to show you today. The first uses rubons only. I really need to use them up, because I have too many hanging around. I can't remember where I read they can get old after a while, and I'm not sure if that is true or not. Do you know? Anyhow...I'm going to try and use some of them up. I love the classic look of a black & white card. I used the wonderful Pure Luxury 120 lb. white card stock as my base, and it gives such a nice richness to it. It's my very favorite white base card stock now! The ribbon is from A Muse (love it!!). I'm a true lover of all snowman, and this one from the Kim Hughes Collection at Cornish Heritage Farm is definitely one of my favorites! He is stamped and mounted with dimensional tape. The card base is an A Muse note card, and I love how this one works for a wintry scene. My snowy hill was cut with my Creative Memories 12-inch Decorative Trimmer, and I added the sparkly snowtop with my Quickie Glue pen and Dazzling Diamonds. I used more A Muse sheer ribbon here as well!! Thanks for stopping by today, and I hope you enjoy the rest of your weekend!! 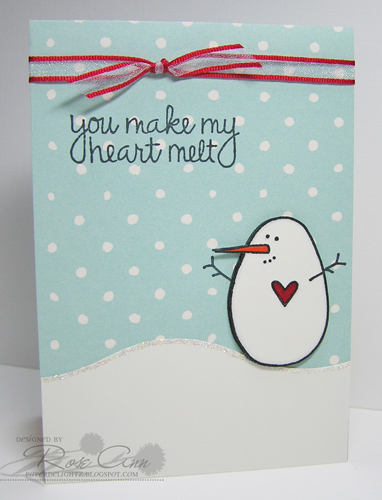 Adorable snowman card! I love him, too! I like how you added the glitter to your "hill". I also like your rub-on card. I have no idea if they get old or not. I hope not! I guess I'd better get mine used up, too! GREAT cards Rose Ann...I love your CAS one...black and white are fab classic colors. Who can resist the CHF/Kim Hughes card?!!! Sooooo cute! I'm LOVIN' the black and white card. So striking!! The snowman card is super cute. Love that hilly snow! I love the simplicity of the rub-ons card ... so elegant and sophisticated! GREAT job, Rose Ann! Your snowman card is soooo cute! Awesome snowman card...gotta mimic this one soon! 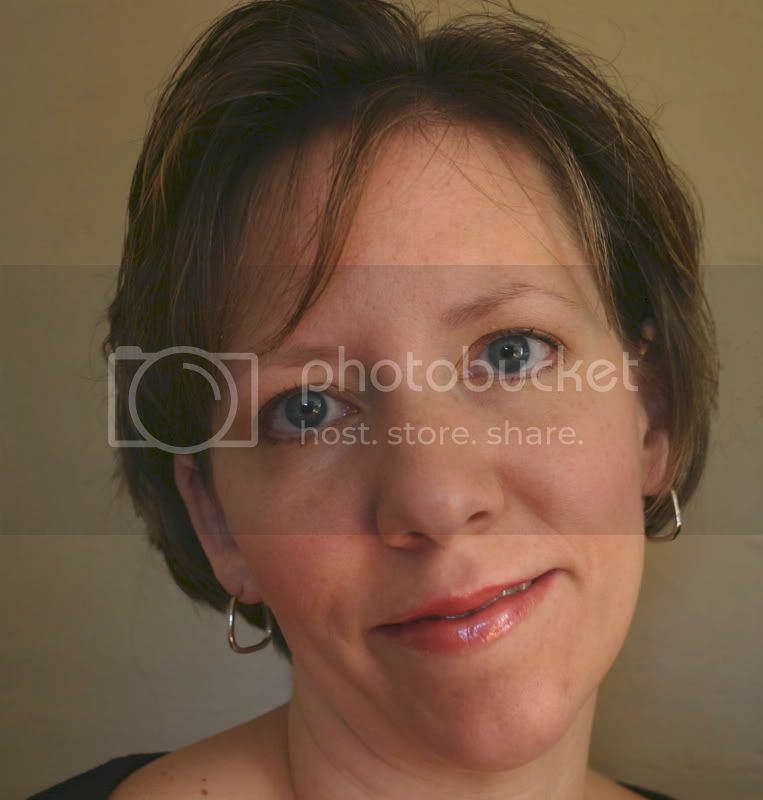 Wow Rose Ann!! 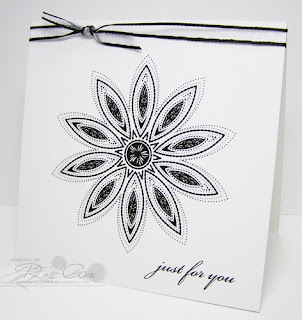 Your black/white card is just stunning!! I love that flower burst!! And the snowman one is just super darling!! Hi Rose Ann...gorgeous rub-ons! Very elegant and classy with the ribbon too, and what a cute patootie snowman! :) I ♥ snowmen too. Adorable, love that sweet snowman, happy week-end. Wow, these are both fabulous. Both are fabulous Rose Ann, the snowman is adorable, and I'm so loving the black and white beauty! Wow! That rub on card is just gorgeous! Love the simple black and white with such an elaborate image. Very striking! I don't know about rub ons going bad. Gee, I have some I'd better get busy with if that's the case. Also, your snowman is too adorable! The A Muse note card gives it such a perfect quick background. Love your snowy hill, too! The first card with the rub-on is so striking in the black and white! The snowman card is so cute! I love the sparkly snow. Stunning card, black & white always look sooo good together. Love your snowman card...who would have thought a snowman card worked for Valentines Day. Perfect! I also have some SU! rubons that are just sitting in my stamping closet. Thanks for the inspiration! Love the clean lines of your first card and your second card is adorable! I LOVE that snowman! That snowman card is just the sweetest and your black and white card is so stunning and elegant. I love the combination of black and white.love all your cards. So adorable, Rose Ann! That snowman card is too cute! Fabulous card RoseAnn... I love that little snowguy... He is adorable. great cards...love the simplicity....the designs are awesome! Very nice cards! That little snowman is one of my favorites too-adorable!! Both cards are just adorable. Your first card..STUNNING. I have heard that once they're old it's harder to use them but i'm such a hoarder...LOL! These are fabulous Rose Ann! I love the snowman with the simple red ribbon. Just awesome! Ooooo...love that black and white card! So classy! And of coure I love the snowman!!! Too cute! 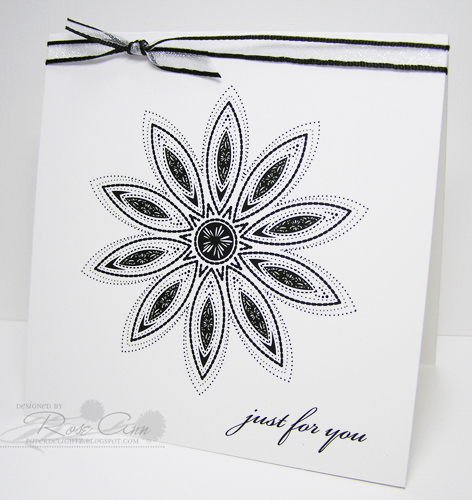 What an elegant balck and white card...I really need to get out my rubons!!! I love the chubby little snowman, too....Thanks for all your inspiration!!! 2 great cards! You've inspired me to pull my rubons out! And I do so love that little snowman too! That rub on card is absolutely gorgeous! Love that little snowman, too. Wow, Rose Ann -- love this pop of black and that snowman card is adorable!